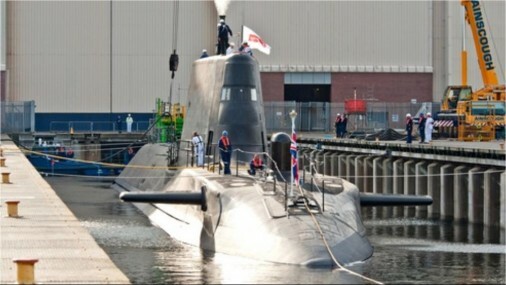 BAE Systems has launched the HMS Artful, the third “Astute” class submarine destined for the British Royal Navy. On Saturday the 17th of May 2014, BAE systems, at their Barrow-in-Furness site in Cumbria, England, has realized the deployment of the HMS Artful submarine. It is the third submarine in its class, following behind the HMS Astute, launched on the 8th of June 2007 and put into service on August 27, 2010 and the HMS Ambush launched on January 6, 2011 and put into service the 1st of March 2013. The HMS Artful will undergo a series of tests to prove the reliability and security of its systems before open sea trials. The Astute class ships are the new generation of nuclear attack submarines. With a length of 97 meters and a weight of 7,400 tons while in dive, the HMS Artful has a maximum speed of 30 knots. 7 units were ordered to replace the Trafalgar and Swiftsure class submarines.